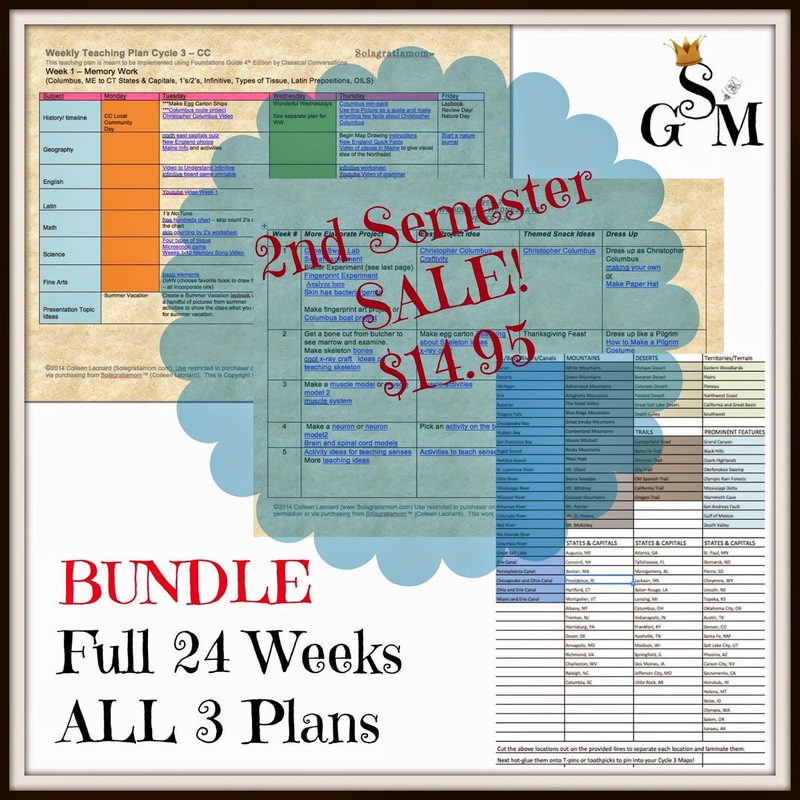 Just in time for the 2nd half of the school year - 1/2 price sale on the Teaching Plans!!! Are you looking for things to do that will enrich your memory work and provide extra hands on learning for your children throughout the week? Is memory work alone getting a little stale and you're looking for some ways to re-engage your child? I have just the thing! 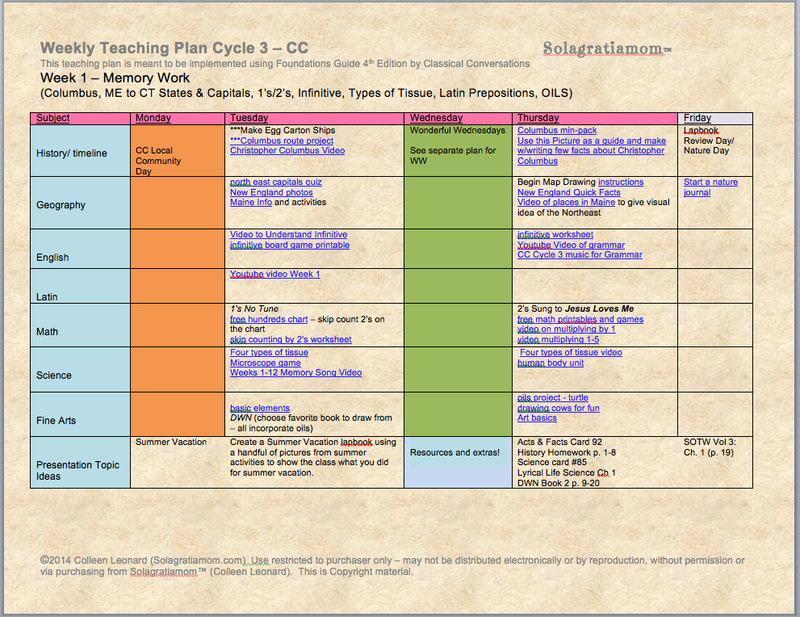 Solagratiamom™ Teaching Plans! 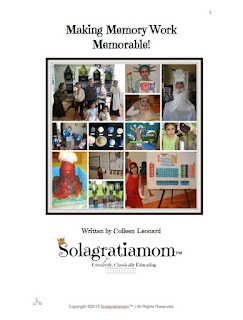 These Plans are a great way to provide some hands on learning to go alongside of the things they are memorizing and hearing about throughout their week. The best part...you don't have to do anything but open up the document and click on a link for the week and subject you want, to take you to wonderful ideas that correspond perfectly. No researching on the internet for hours or wading through a million links! I've done all that hard work for you! 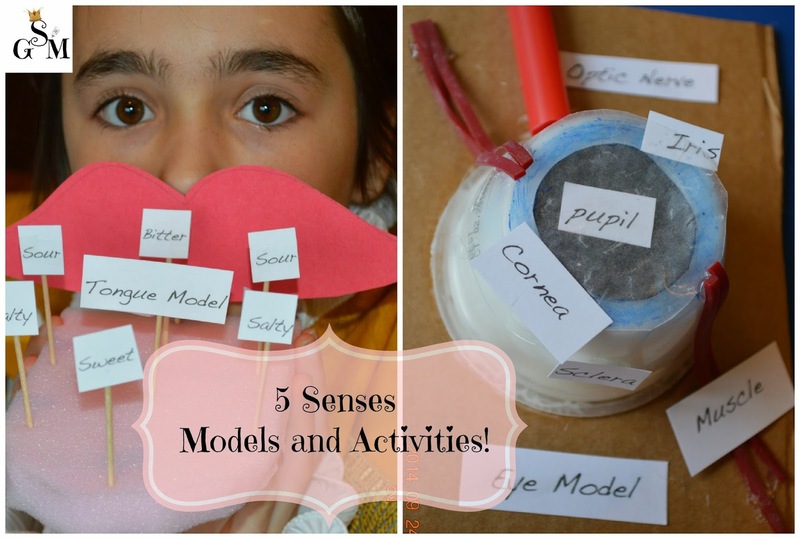 I've selected the most relevant hands on activities, videos, games, worksheets and more that are available. It's laid out day by day and week by week, covering 24 weeks total. In addition to that, all the supplemental resources that are recommended, are lined up by week -all in one document organized by the week and relevant pages! Things such as Draw Write Now, Lyrical Life Sciences, the Everything You Need to Know series and more are lined up! If that wasn't enough, I have also created a corresponding Pin Map document for you to create your own Pin Map from the blackline maps for home. You can see what a completed pin map looks like over at my Cycle 2 Pin Maps post. Finally, just incase you are super motivated or super social - I have also created a Wonderful Wednesday document that specifically focuses on one area of science or fine art and one aspect of the history, to come alive for your child with ideas for fun activities, costuming, themed snacks and more! It's an additional opportunity to get messy and hands on with the concepts they are learning and geared towards multiple children or a group of a few families. The reason I am creatively classical, is because I myself love the classical model, but I have children that need a little more creativity and hands on execution, to be successful with this type of curriculum. If you have one of those children, or you are that way yourself - then this may be just the answer you have been looking for! Have a blessed and joy filled 2nd half of the year! Is this for all 3 cycles? I wanted to purchase this for next year but when I put it in my PayPal cart it just said Cycle 3 on the memo so I wanted to make sure it wasn't just Cycle 3- let me know, thanks!